Making sure people are equipped and dressed to do their work safely and healthily should be common sense, but it’s also required by law. The Health and Safety Executive says that people must be protected against any health or safety risks at work. Where health and safety cannot be adequately controlled in other ways, the Personal Protective Equipment at Work Regulations 1992 require employers to provide suitable Personal Protective Equipment. When companies provide Personal Protective Equipment they have to make sure it’s properly assessed to ensure it’s fit for purpose, that it’s stored and maintained correctly, that users are provided with instructions on how to use it properly and that it’s used correctly. This doesn’t just extend to workers. Customers and visitors also have to be protected whenever they are in any workplace or site with health and safety risks. Personal Protective Equipment reduces workplace accidents and ensures the safety of all site users. It’s essential in the agricultural and building industries but also in food handling environments, warehouses and many outdoor settings. Wherever people are using machinery, chemicals, or might be exposed to flying sparks or grit, eyewear is critical. The loss of sight or total blindness caused by eye damage at work is likely to cause trauma to victims, but can also lead to employers facing legal action if they did not eliminate the risk of eye damage or provide protective equipment where the risk could not be fully removed. Available through Speedy Marquee, Jackson V10 Safety Glasses protect users from eye injuries, offering a sleek and lightweight design, comfort in use and optimum eye protection. In warehouse or factory environments, work yards or wherever visibility may be reduced, workers and visitors need high visibility vests or jackets. This could also extend to supporting employees who drive for work and would need to be more easily spotted in the event of their vehicle breaking down. 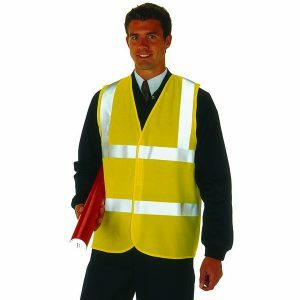 Yellow high visibility vests are designed to fit comfortably over work clothes and features HiVisTex fabric and 50mm reflective tape for added visibility. They are easy to fasten even with gloved hands, with simple Velcro fasteners at the front and are rated Class 2 under European Standards for intermediate level visibility. Head injuries can be caused by falling objects, slip and falls or broken equipment, so wherever there is a chance of this in any workplace, people need to be given the appropriate protective headwear. Designed for forestry and industrial applications, the 3M Peltor G3000 series safety helmet range has a rounded shape to avoid snagging and a short brim for a wider field of vision. 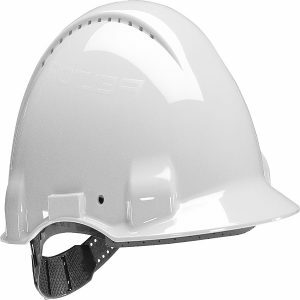 For outdoor workers, the unique Uvicator Sensor Disc highlights when a helmet has degraded due to UV exposure, informing the wearer when it is time to get a replacement helmet for maximum safety. 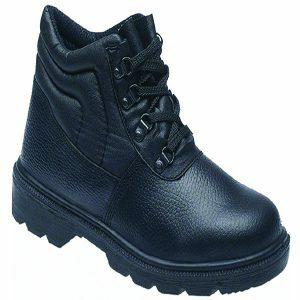 Supplying steel toe cap boots is a health and safety requirement in many industrial environments. Steel toe cap boots are durable footwear recognised as Personal Protective Equipment. Important in settings such as construction sites, they can prevent or minimise injury to users by shielding feet from falling objects or compression. Briggs Proforce Toesavers S1P Black Safety Chukka Boot Mid-Sole are high quality safety boots suitable for even the most hostile environments, keeping feet comfortable and protected. A dual density sole ensures more grip than with a normal shoe and protection from static shock. The boots include a steel mid-sole and toe-cap, so that the most delicate parts of feet are protected against injury. There are a variety of dust masks, respirators, filters available to protect workers who are at risk of inhaling a wide range of potentially harmful substances. It’s essential to buy the right type for each specific environment. 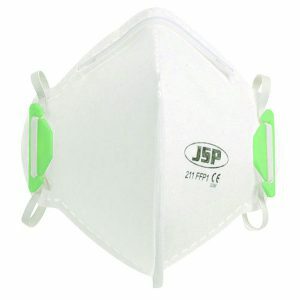 For some dusty environments, Fold Flat Face Masks are the answer. These are available in packs of 20 from VOW and are designed to reduce inhalation of fine breathable dust. They are useful when working with brick dust, concrete, plaster, insulation and sandstone. Thinking about how people are handling food and what’s covering their hands when they touch it matters. Workplaces’ duties to protect employees and visitors includes ensuring all food they may eat, or handle themselves, has been safely managed. Kleenguard G10 arctic blue safety gloves come in packs of 200, enabling anyone who handles food to do so more safely and hygienically. 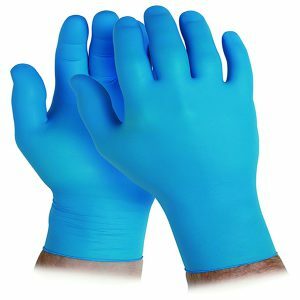 These nitrile gloves are powder and latex free to reduce allergies and contamination. They are suitable for automotive, warehousing, transport, cleaning, food processing and catering use.